Firefighter’s Full Dress Uniform is requested. No Apparatus; parking is very limited. Any department planning to send apparatus to the funeral service on Sunday Sept 21st at Duke Memorial Church, please be at the church for parking at 12:00 noon. If possible, please email Chief Lanham at rlanham@louisburgfiredept.org for number of apparatus your department will be sending so we can adequately plan for this event. FRANKLIN COUNTY, NC – According to the Franklin County Sheriff’s Office, the firefighter killed Tuesday afternoon has been identified as John Derek Gupton. Kyle Horton is the firefighter that was injured. He was treated and released. FRANKLIN COUNTY – A firefighter was killed and another was injured Tuesday afternoon after the fire truck they were in overturned in Franklin County. Franklin County Sheriff Jerry Jones said the tanker truck was headed to a call in Louisburg’s Lake Royale community around 5 p.m. when it overturned on nearby Sykes Road and hit a culvert. The driver died, and the passenger was being treated at a local hospital, Jones said. Their names have not been released, and further details weren’t immediately available Tuesday night. FireNews.net has learned that the apparatus involved was from the Justice Fire Department. ROCKY MOUNT – More than 100 Comfort Inn guests were evacuated for several hours Friday night after a fire broke out in a room on the third floor. CHICAGO, ILLINOIS – A firefighter from Greensboro died Sunday after collapsing 500 yards from the finish line of the Chicago Marathon. East Care responded to a serious MVC involving six vehicles. 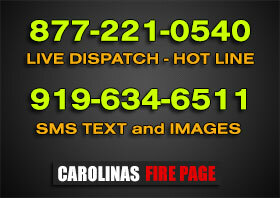 Cary firefighters responded for a fire in a two-story townhome. Sandy Bottom Fire units responded for a vehicle vs motorcycle collision.